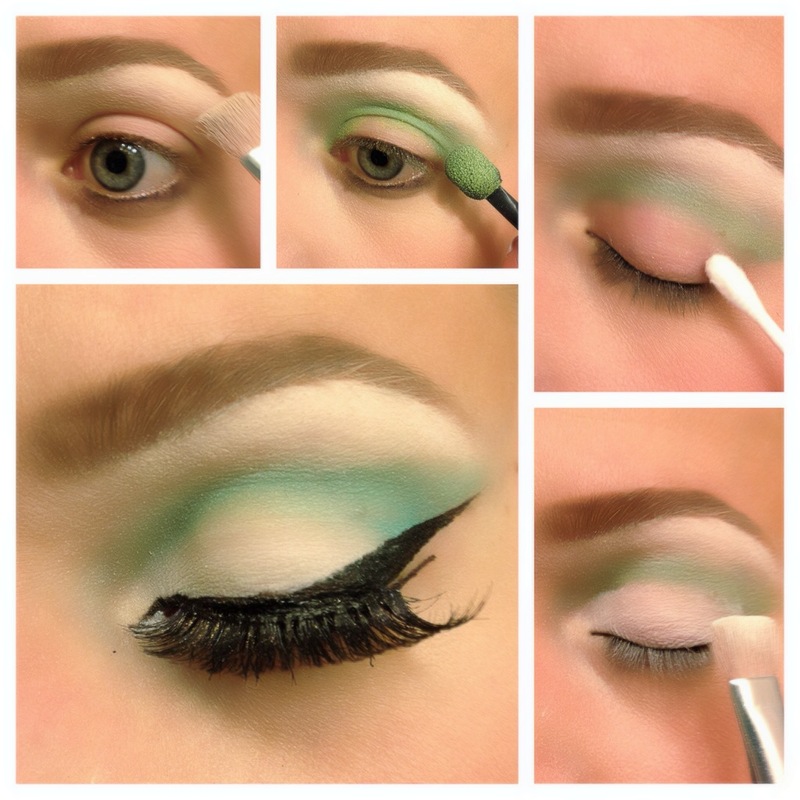 Where are you wearing your green this St. Patrick’s Day… perhaps on your eyes??? PERFECT because I have just the look for you. I love every single holiday, I am a pretty festive person, sometimes a little over the top. I can’t help it, it is so much fun to dress up. I thought this would be the perfect eye make-up for St. Patty’s. Enjoy, let me know if you have any questions i’d be happy to guide you through the process. Step by step application process below! 1. Add white eye-shadow along the under crease of eye-brow in a packing motion. Apply a second layer of white eye-shadow in the same spot, this time in a sweeping motion to smooth it out. 2. Apply green eyeshadow in the crease of your eyelid. Start in the outer part of the crease applying the eyeshadow fairly heavy and work your way over the crease towards the inner part of your eye. Do this in a buffering motion, so you are sure to blend it nicely. 3. With a Q-tip clean up your eyelid and make a defining line where the green stops and your skin begins. 4. Pack in the white eyeshadow on your eyelid, I prefer it heavy. 5. With a Q-tip clean the sides of your eyes, dragging the Q-tip from the outer corner of your eye drag it diagonally up towards the end point of your eyebrow. This will give your eye shadow a defined sharp clean look. 6. Apply eyeliner. I did winged eye-liner on my bottom and lower lash lines. Then filled in the inner part of my bottom lash line with white eye-liner. 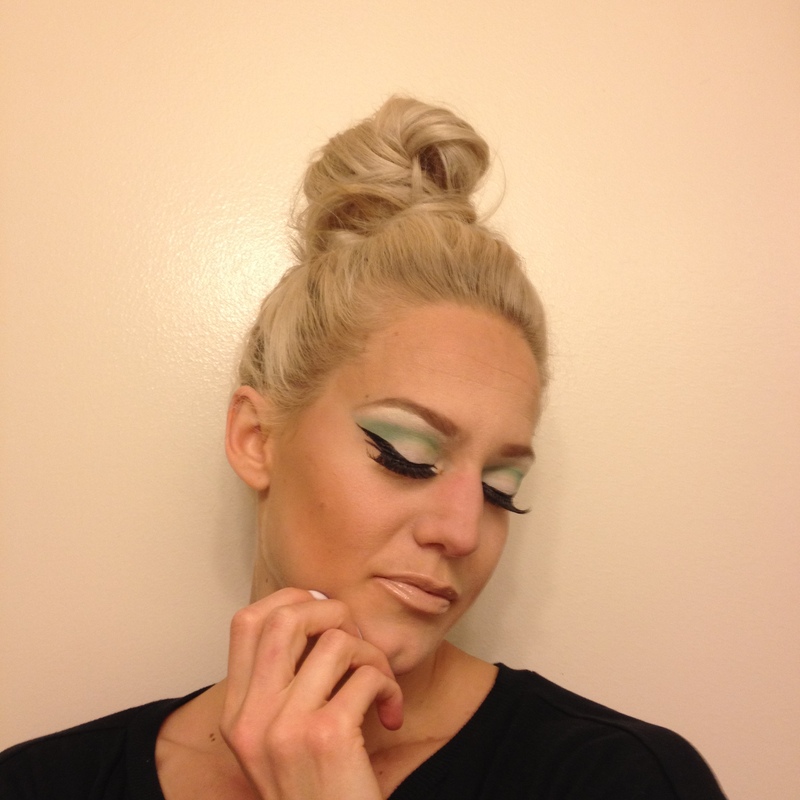 All finished, hope you enjoyed the look and it gave you a little green inspiration for St. Patrick’s Day! this is such a magical eye makeup! love the light green shade and that’s a perfect wing eye! Thanks girl, I’ll definitely check it out! the green eyeshadow with your blonde hair looks amazing! i love the cat eye liner too! stunning!